Born in Eriksdale, this rugged defenceman played junior hockey with the St. Boniface Canadiens and was added to the roster of the 1959 Memorial Cup champion Winnipeg Braves. 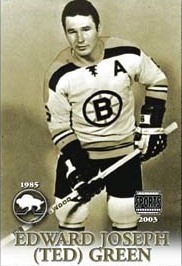 He turned pro with Boston in 1960-61 and played on the Bruins' 1972 Stanley Cup team. He played another 7 years in the WHA with the New Eng land Whalers and the Winnipeg Jets, winning 3 Avco Cups. "Terrible Ted" Green played 1,072 pro games.